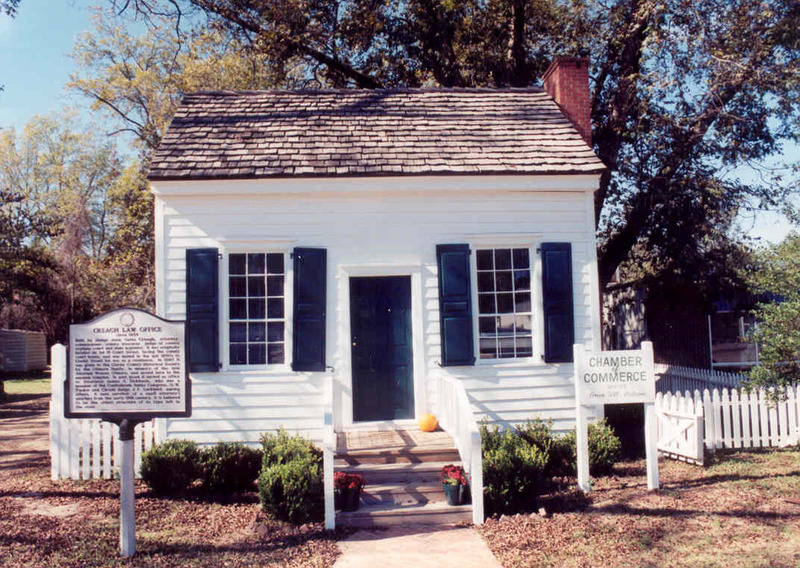 Believed to be the oldest structure of its type in Alabama, the Creagh Law Office, circa 1834, was built by Judge John Gates Creagh who was an attorney, commissioner, county treasurer, judge of orphan’s court and state legislator. It was moved to the Museum grounds in 1990 for restoration and inclusion in the Museum properties. Mrs. Wyman Gilmore donated it to the Clarke County Historical Society in memory of her husband and Grove Hill attorney, Wyman Gilmore. It currently serves as the home of the Grove Hill Area Chamber of Commerce. The first record we have of the Creagh Law Office is from the Commissioner’s Court report of James Savage, County Treasurer, on August 7, 1833. Its entry shows that John G. Creagh, a former Treasurer of Clarke County, was the owner of Lot 15 in the town of Macon (now Grove Hill) and that he paid $20.50 for his lot. It is on this lot that the law office was built. For more information on John Gates Creagh and his law office please refer to the Quarterly, Volume 17, No. 2 and Volume 18, No. 3.